Every once and awhile a vision passes by me, on the computer or otherwise, that immediately starts my mind burbling. 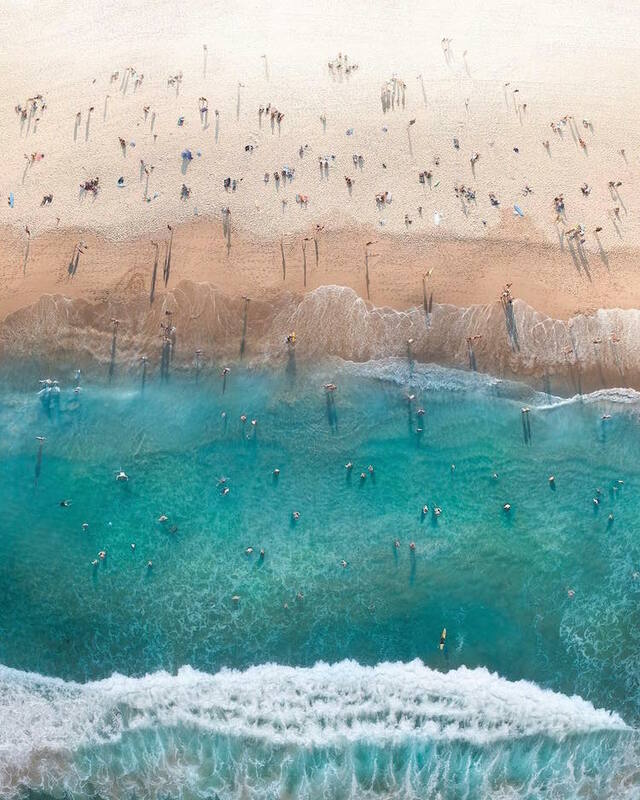 This is one, by drone photographer Gabriel Scanu, who is apparently all of 20 and blessed with an excellent eye. This photo speaks to my wet-felting soul. I can see it evolving with tracings of silk for foam, with needle felted people and shadows after the base has dried. I love the contrast of the shadows on the sand and in the water, the view of a tiny kayak braving the waves. I know local artists who could paint this, beautifully. There’s something about looking at the world from way way up that is consoling these days – being above the world on an impossibly sunny day, not even hearing the quibbles of the people below, the children whining for ice cream, the couples fighting… This photographer has given me a vision to think about, a respite from the worries around me. It’s a pleasant thought to be above trouble and sorrow. It seems most everywhere I look in the past month, people are dealing with challenges, losses, changes that are unpleasant and require strength to manage. I know artists and musicians who are dangling, unbought, while the world takes advantage of the Maude Lewis story and millions go into Hollywood coffers while the poor woman lived and died in pain and poverty. I was talking to a friend of mine who also finds this enraging. No one seems to feel the urge to donate to starving artists after the film, or to donate to the arthritis society, or to do anything other than buying reproduced Lewis art calendars (just the small ones, they aren’t too expensive), while our world, especially here in the Maritimes, is full of fresh new art, folk and other, that could use a loving touch, a new home. I’ve been trying to buy a bit of art on my tight budget. I’ve been blessed with a few artist friends who started my collection, and I am meeting more all the time, thanks to the patient gallery owners that let me linger among the small pieces and put things on hold, or trade what I’ve made. I adore each and every one I’ve chosen, both for the beauty of the piece and for the fact that I know the artist. Art brings visions to us, places and thoughts we have never seen, joy. I live in a smallish, somewhat dark apartment, but around every corner now I have a little spot of brightness, a view of an artist’s vision of life. They make me smile, every time I look at them. I’d like to encourage everyone to spend a little on art, especially local art. It seems like an extravagance when bills speak loudly in the corner. But for a relatively small amount of money, you can bring beauty to the world, both your own space and in the artists’. And couldn’t we all use a little bit of joy (and vision) these days? Cost of the workshop is $50 plus taxes. All materials will be included to make your very own posable felted four-footed animal.